Substance for Unity 5: Creating PBR textures for environments and characters. Chapter 3: Creating an environment material in Substance Designer. Lesson 1: Creating a scene in Unity, Pt 2. 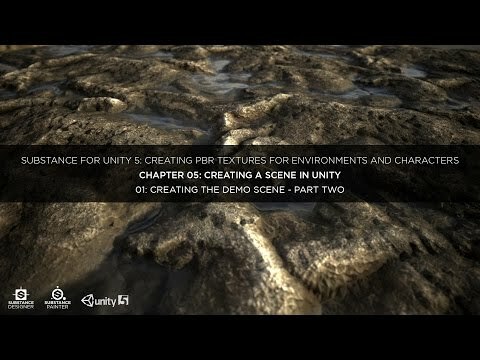 In this lesson we will finish the series by completing the scene in Unity. Support for this topic is provided by Allegorithmic. Please click HERE for the support topic on the Allegorithmic forum. Complete project files can he downloaded HERE. Founded in 2003 in France, Allegorithmic develops the new generation of 3D texturing software: Substance Painter, Substance Designer and Substance B2M. With most AAA game studios having integrated these tools into their pipeline, Substance has become the industry standard for authoring PBR textures and is now part of the essentials of every art school. They have been tightening a close relationship with key industry players for years with companies such as Unity, The Foundry, Autodesk and Nvidia. Their clients are major studios like Sony, Ubisoft, Activision and Electronic Arts as much as a very large community of indie developers.